This entry was posted on April 16, 2013, in Cleveland and tagged celebration, city of cleveland, Cleveland, event, Jack Marschall, Joe Calabrese, Mayor Frank Jackson, news, RTA, RTA Cleveland, Silver Award, tv, TV20, TV20 Cleveland, Weekly News Wrap-Up. Bookmark the permalink. 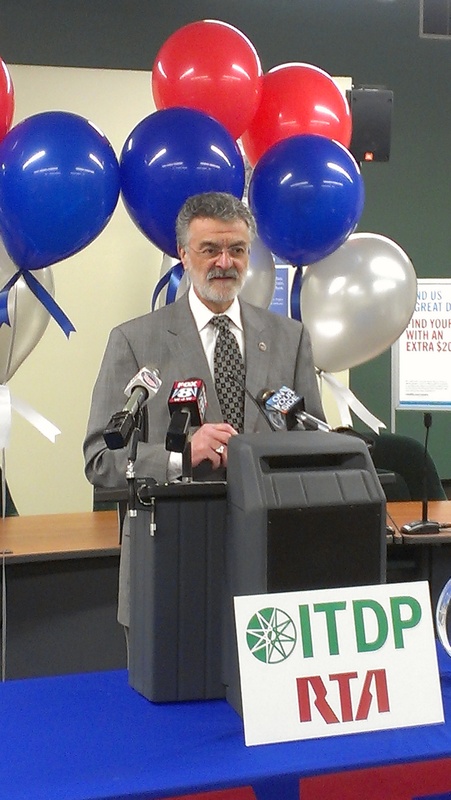 Mayor Frank Jackson spoke to the crowd at the Greater Cleveland Regional Transit Authority today. The RTA was presented with the Silver Award by the Institute for Transportation and Development Policy, citing RTA’s Healthline as the best Bus Rapid Transit system in the country! The award was presented to both Mayor Jackson and RTA CEO and General Manager Joe Calabrese.